This is a very informative post. Thank you. I have a question though. I was living with my husband for two years after which I moved to another city for work. The house I am currently living in is registered as a nebenwohnung. Will I need to pay this fee seperately for the nebenwohnung? Hey Sam. You can apply for an exemption under certain conditions. More info on that here. I have been registered in Germany for around 9 months now. Till date have not received any letter from ARD. What can we do to start receiving letters? Also, if we are not paying ARD due to any reasons, will it affect our SCHUFA score? Hey Amit. You can go on this page and use the form ” mich erstmalig für den Rundfunkbeitrag anmelden” to let them know. I recently moved to Germany but I still have to go to register at the Town Hall. I also got a TV, I plugged it in, but it doesn’t find any channels. I was wondering if I have to pay the monthly fee first and then I will be able to watch TV, or is there always TV service? Hey Mihail. No, both of them are not linked. 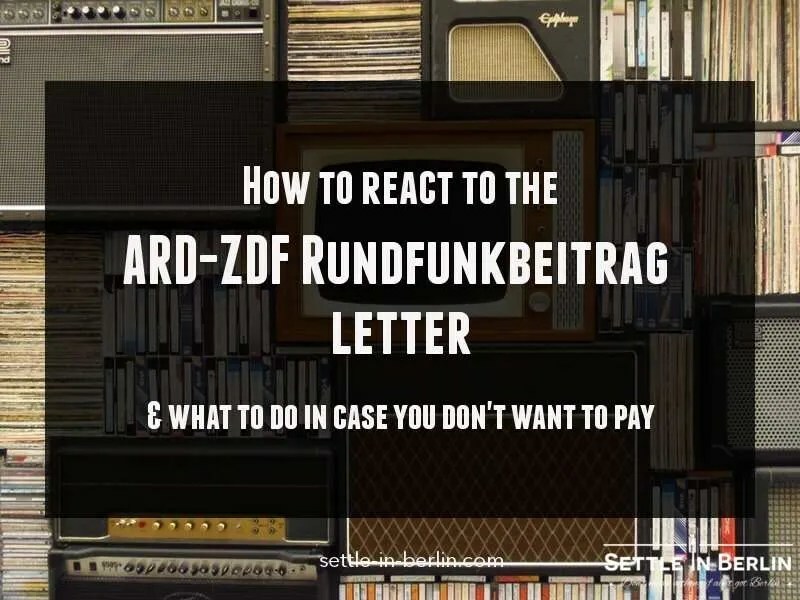 I started living in a small apartment in Germany and recently got the bill from Ard ZDF. I wanted to know if I should still pay, even if someone is paying from the other people in the building? Also I am an azubi, are you aware if there is any reduction of the fee for me? Hey Jojo. If you receive Ausbildungsgeld, then yes, you can apply for a reduction. Otherwise, the fee is to be paid per household, and not per building. I am staying in an share appartment. My friend is paying radiotax and he is about to leave this month and he deregistered it. I joined with him and shared the amount till now. But for the first quarter period we didn’t got any letters and we didn’t paid yet. 1.will they send letter for Jan,Feb,march month due to him, even after deregister? Is it possible to pay after deregister.? 2. If I want to register again, should I give the move in date as January or April? 3.how to pay for the first quarter month due.? 4.will they send letter to me.? If the letter arrives after 4weeks, should I pay fine for the first quarter.? We Don’t know what to do in our case. Pls help in clearing​ our doubts. Hey there. 1-No idea. 2-April 3-They will let you know how to pay if it is due 4-In their eyes, they only look at household level. If it has been paid for Q1, then all good. They don’t care who pays. My landlord says he is already paying this but can not find his contribution number. Are there ways to get out of this without their number? Hey Rachel. Well, i’m not sure it’s going to be easy. The best is to get in touch with them and ask them directly what to do in that case. -Is it possible to demonstrate that one hasn’ t been living in Germany for those years and does not have to pay for the time he wasn’t living in the country? -Is there a way to ‘reset’ the debt when going back to Germany, registering to the ARD ZDF and start paying from zero (having never registered to ARD ZDF before)? Isn’ t there a time after which the debt is cancelled? -How do I existimate how much the amount owed has grown up to now (considering also the fines due to the delay)? -Can one be forced to pay even if living in another country other than Germany (eg Austria or the Netherlands). Hey Tommi. All very good questions. Not sure i can answer all of them. 1- Yes i suppose. But you won’t get away from the debt you collected before, while living in Germany. 2- Can’t answer this one. That’s inner workings at the Rundfunkbeitrag collection service. 3- Refer to the monthly fee and multiply by time. Anything related to payment and fines is explained on this page.. 4- I don’t know. Thank you so much the site, it was very helpfully. I am came from Abroad. I live alone in my flat. I have to pay the radio tax fee, but now I got a new job opportunitites and I am move out from my flat into a Hotel room where can I register myself in. In that case, should I have to pay the Rundfunk fee? I think the Hotel already paid so I dont know. Should I write a mail to the company? or they will see under my new address this is a hotel? Hey Richard. You have to clear this up with the hotel directly to see what their policy is. Hi, thanks for the information. I have a question. I received a letter last year but my tenant at the time said he was going to take care of it and he wrote them. Apparently he was paying it for a year. Few months ago he moved out and I took over the contract of the apartment with a friend of mine. We haven’t received any letters yet… does that mean that I have to register again? And if not, do I have to contact them and will they charge me for these last months that no one payed? Hey Rachel. You don’t have to register again in that sense but you need to get in touch with them yes, and they will probably charged for the past few months too. When is this tax to be paid? I thought that this was needed to be paid as and when they send the bill. However, they just sent me a letter asking me to pay for 3 months 52.50, along with a fine of 8 euro. Do I need to pay this amount in the beginning of the month or quarter or year? Hey Varun. You may want to double check that but it is likely that they cant put a fine on your case if they hadn’t sent a notice to you in the first place. Check that. Payment is due as per what is mentioned on the letter you got. Hey Norman. Use one of the contact forms on this page to ask for a new one. I have a flat since 2014 in Germany. I register myself in Germany but I I wasn’t resident in Germany. I was resident and working in France until July 2018, pating my taxes there. Since July 2018, I get a job in Germany and I live in my flat in Germany. I get a letter few months ago. Do I have to pay since 2013 or since July 2018 ? Hey RG. Interesting question. It seems that your flat in Germany would be considered a “Nebenwohnung” until July 2018, so you would not need to pay for before that time. Double check that yourself here: Source. I have done online registration with bank details, its been more than one week but still i didnt get any notification on it.I am afraid I will get fine amount. If they make it delay in giving me registration number then they shd be responsible right?? Where can i find their office in Berlin?? Hey Srinivasan. They may take a bit of time to process your file so i would not worry just yet. If they want to fine you because you are late, just show them your registration confirmation. Hei I have one question. Hey Matjaz. It may only be a matter of time until they process your file. What’s important is that you can prove you have sent back something. Did you send the letter to be delivered with signature? Hi, I moved into a brand new building in Feb 2018 and haven’t heard from the Beitragsservice von ARD, ZDF und Deutschlandradio yet. Is it advisable to go and register on their website then or should I just wait for there eventual letter and pay 100’s of euros then? Hey Memphis. Both options are possible. I guess you understand the outcome of both scenarii. Never go by yourself and register. Wait for them to contact you, don’t be stupid! Disgusting that this is still a thing in 2019. Same garbage in the UK, but at least there it’s still just a BS fake “tax” that you simply can ignore. The worst they can do is send round the heavies that have no right to enter your home. I’m already paying for Netflix and Amazon Prime for my entertainment and I use a small projector that doesn’t have the ability to pick up analogue or digital television broadcasts. I don’t even own a car, so no radio receiver either. €210 a year from everyone in the country? It’s nothing less than extortion perpetrated by criminals. 1) If there is some online portal through which I can check how much Contribution fee is pending with them by entering my beitragsnummer ? 2) Can I write e-mail regarding that the apartment is shared with another person(giving his beitragsnummer ) and that person is paying the fees ? Hey Sammy. 1) Not that i am aware off. Maybe try by phone?. 2) Yes. Hey sammy i have the same issue but i could not find any email id.if you know could you let me know too.. secondly, calling is not an option as the option of calling them i think is blocked. Hi, what if I’m just registered at an address and not living there? Am I still obligated to pay? Secondly, if one is receiving ALG I, is there an exemption? Thanks for your help! Hey Hinna. You still need to pay if you are registered there. ALG 1 does not constitute a reason to be exempt i’m afraid. I got my radio tax letter a month ago and finally wrote back to them today filling all my details but by mistake, I sent the reply with my bank details in a new envelope that I bought from Deutsch Post and not in the envelope they provided. Will it be a problem? Hey Shiva. I don’t know. Hopefully there was a little paper slip that came with it. Hey, I am a student in germany, I received the letter and paid for three months as 52…, and then this month I received another letter asking me to pay for another three months while I am leaving in February, I called them but they only speak German, what can I do to not pay for March! Hey there Reda. Go there and look for the contact form “Wohnung Abmelden”, it covers this case. You will be able to let them know that you are leaving Germany then. Hi, i have the same case. I moved here in Germany since August of last year. Since then me and my roomates have been sharing the payment for the Rundfunkbeitrag regularly. The bill is registered in my name . However I am moving to a new apartment starting first of february and there i am only living alone and i can’t afford to buy a television yet. Me and my roomates agreed that i will just pay the last bill for my old apartment. So what shoul i do so that i wont be paying 2 bills at the same time after i move to a new apartment. Hey there Noel. Go there and look for the form “Wohnung Abmelden”, it covers this case. I am paying Rundfunkbeitrag regularly since six months. My next bill is from December 2018- February 2019. But I am changing my apartment from 1st of February .. should I pay the Rundfunkbeitrag for February for my old apartment ? How can I notify the rundfunk about this ? In my new flat ,the flatmates are already paying the rundfunk .. what should I do ? Hey Ann. You can use the form “Wohnung Abmelden” which covers that case too. Here. Pick the optionn “Ich möchte eine Wohnung abmelden, weil… -> ich zu einem anderen Beitragszahler ziehe”. How can you prove that someone else pays this TV tax for you? What is the process in place? Hey Miche. You get a hold of their Beitragsnummer and a copy of your Meldebescheinigung so they can see that they live at the same address as you. After getting these 2 documents, how exactly can I let them know ? The website seems to have forms in German and is asking for a 10-digit Aktenzeichen , which is not the same as 9-digit Beitragnummer. Hey Rahul. The Aktenzeichen probably refers to the latest letter/communication they sent you. Hey Esther. What does this mean? are you stationed in Germany as a foreign military force? I used to live in Germany as a student (04.2015-07.2016) and then I moved out. I never payed the tax, which had stacked up to 200-300 euros. Currently I am again here as a student. Before I used to have a different account number and now I have been receiving letters with another one. I have not contacted the GEZ in any way. They started sending me letters with a new number but I am registered with the same name as before. They either are assuming I am a different person with same names or maybe how they registered me in Bürgerbüro is different. Or maybe they couldnt find me when I moved out and forgot about it? Can I just not pay that old part from the tax I had? Is there any chance they will find out and start searching for me for the old tax amount? To be honest I really dont like this tax for obvious reasons. Hey Bo. Can’t possibly tell what they are able to do with their current info. Sorry. Then can you tell me if the fee stacks up gets bigger and bigger every month based on the amount I owe them? Many thanks btw the information and comments here on the site have helped me out. Hey Bo. If they find you again, that’s very likely yes. How is the situation developing for you so far? I am in the same position: i lived in Germany for my Erasmus for half a year and now planning to move back after 3 years. Hi, Very informative stuff posted! Love it! Just a small question. Me and my friend share an apartment. So that means that the radio tax money is divided between us right? But we have been receiving letters from ZDF on both of our names. The payment backlog for my friend is a huge amount and wouldn’t it be sufficient if only one from the apartment pays the entire radio tax amount? How do I make them understand that we both live in the same apartment? Hey Badhri. The fee is applied per household. How you divide the fee between everybody is completely up to you. You need to get in touch with them and let them know there was a duplicate. You can refer to the “Beitragsnummer” indicated in the letter you received. Thanks for that article. I’ve moved into my own apartment in Berlin 4 years ago and last week I received a letter from ARD asking me to pay from my entry date. I did my Anmeldung 4 years ago and all my papers are in order. I simply never received that letter until now. I think it’s a bit unfair that I have to pay more than €800 now, while it’s their mistake. I mean, I’m fine paying on a monthly basis but now the amount is a bit excessive!! Did anyone have or hear a similar experience? We are here in Germany for 9 months. The first three months of our stay was in a hotel. Since May we live in a small apartment. So, in this letter it is calculated the amount for these three months. From the very beginning we recieved the ZDF letter. Should we pay only for the months we are staying in the apartment or for all. P. S we haven’t paid yet. Hey there. I’m not sure what rules apply to hotel. You have to talk to the manager i suppose, to check if the pays the tax for his tenants. Hi! I have been living in Munich in a shared student dorm for two years and have never received such a letter. Does this mean someone else is paying for me? Hey Dorothy. I don’t know. Possibly. does the tv charge differ from city to city? I have rented an apartment in hamburg, how much should i pay once a month? it is urgent! Hey there. It’s the same rate nationwide. It seems like GEZ/ARD had improved their chase for “missed” household this August 2018, where I’ve received there first letter after 5 years being registered in this apartment. Is it lawful from consumer/citizen perspective to ask to pay them retroactively 2 years back (almost 600 € ) ? If they detected my household just recently wouldn’t be more appropriate to charge since that date? Why would i pay such amount for the “fault” in their system? Hey Abigail. We are diving into legal territory here. A lawyer would guide you better down that road; i don’t want to give you wrong advice. sorry. I have a similar case. They want me to pay two years retroactively… What did you do? HI. I had encountered similar scenario. As per new law, they cannot ask you to pay for total 5 yyears. instad, you have to since january 2016. I’ve also received a letter from ARD asking for ~1000 EUR for 4 years. Could you please share the name of this new law? What is the case if I did not actually get the letter? What if you move away from Germany, but still owe some money for the TV Tax? Are they going to try to find you in another country? Hey MP. There is no experience i can think of on the matter. In my opinion, it’s most likely not going to happen, unless it’s a large amount but they will hunt you down if you ever come back to Germany and it will impact your SCHUFA score a lot. I pay monthly TV tax for German channels. I do not have a TV and can not watch channels via antenna or cable. Can I watch these channels (which is included with mtllhly TV tax) via laptop without paying extra money? – Do I need additional devices or apps for this? -What is a channel I can see? Hi Jovanka. Yes, you can any of them online. That’s perfectly legal. No need to install apps, you can just stream it in the browser. You can see the list of public channels on this page. Anybody have experience with this: I am moving away from Germany, going back to the US. I wasn’t paying the TV tax for the first 9 months I was in Berlin, but in my current apartment, they started to send me the bill. I wrote to them, in English, explaining that I don’t speak German, don’t have a tv or a radio, and that I am moving out of the country. The sent me one big bill for over 100€. As far as I know, they know nothing about me other than this address, and my German bank account. I am closing that German bank account before I move. SO what if I just don’t pay it? Will there be a black spot on my record in Germany? Could it cause any troubles for me if I were to ever move back here again (unlikely, but you never know?) And could they hunt me down, somehow, in the US? Hey Matthew. If you ever come back to Germany, that might still show in your SCHUFA record. And i guess there is a slim chance that they will chase you. Hello, can somebody tell me how to prove somebody else is already paying the TV fees for our apartment? Thanks in advance. Hi Mohammed, just let them know the Beitragsnummer of the person living in the same household who’s paying for it. Bastien is right — I’ve helped a number of people with this. Just call the Beitragsservice at the number on the letter you received, and tell them the Beitragsnummer of the other person — which will be on the letters/ bills that _they_ receive. The only problem I’ve ever had is that in a couple of cases, they didn’t seem to get it the first time — they started sending bills again — but another call fixed the problem every time. Can foreigners (esp students) claim back the tax money before leaving the country? Hello, very useful information indeed. 1. will they debit the money right from from the day i lived in Germany? If such is the case, I cannot afford to pay such a huge bill at once, and it find it completely unethical. Hey Madhu. Well, in the letter, they usually tell you how much you owe them if you have late fees, so i don’t think it will be the case for you. Is this true or I can still fight it over the phone to start paying only from now onwards? Hey Mani. I have no idea. It seems that there is no rule from my small knowledge on the matter. I guess it doesn’t hurt to try. I have also received a letter in Sep18. Letter does not state any amount due, and exactly same content what Madhu has received. SO I am not sure what to do with it. Hi there! Did you figure out what to do? I am in similar shoes:) thanks in advance. Same problem here, any updates guys ? One question, can we pay the rundfunkbeitrag with an european bank account? In my case Portuguese? Or do we really need to have a german bank account? My owner is already paying the RADIO Fees and he told me to merge my beitrag number with his number so that i should not pay the double fees for the apartment. I am not getting the option to merge my number with his. Could you please help me with the merging process where I add my beitrag number with his number. Hi Mohit. I don’t think it’s quite merging, but simply let them know that your landlord has paid the fees already, with his Beitragnummer. I am paying ARD in my current house, now I am moving to a new apartment, the ARD comes in my name, what do I need to do to de register ARD from my name in the previous apartmrnt? Hi Deborah. Tell them you move places. Are there any precedents of people claiming back the money in retrospective for similar cases than mine? Hey Sergio. I haven’t heard of such cases before although they should have told one of you that it’s only one “Beitrag” per household. They don’t have any form for this on their website, so a good ol’ letter will probably be the first step. Good luck. That’s a good pile of cash! Hi, I am in Munich Since 1st of Jan 2018, now i have received the letter from ARD for Jan 1st to May 31st as 157.50Euro. But it suppose to be 17.5 * 5 = 87.5 right? Why 157.50? Thanks in advance for your support. Hi Samy. No idea. Best is to ask them directly. Before one year i received a letter of 650 euro debts from last 2 years from Tv Radio.I had paid that amount from online. After that i thought that fee is paid by my friend with whom i sam sharing my room. I didnot care about those letters but now again i receive the letter of 291 euro and now i am afraid wether they will take action on me ? They have send me a letter and mentioned that i am abemeldet. What can i do now to solve my problem? Please give me a suggestion. Will they send me back to my country or put me in jail or take something negative action on me?? Hi Binod. Sorry, i don’t really understand full. You need to let them know that the person you are sharing a household has paid already. What’s the issue there? Hi, how can I notify that my flat mate already pay this tax? Hi Andreia. This one would work with changing dates and adjusting details to fit your situation. Hope this helps. hallo, I want to ask you if my flatmate has already registered in GEZ, do I need too register myself too? hello! I have been in Germany since september 2016. I never received any letters from them? What should i do now? Please reply! Thanks! I am a language assistant in Germany since Ocotber 2017 and I will leave this month. Hi Sarah. You should notify them that you have changed address to avoid paying double fees. I am almost a year in Berlin, and I never received a letter from them, what should I do? as I don’t want to receive a big amount or face jail for that. Hi Ahmed. It’s up to them to notify you about this so i don’t think you should worry for now in my opinion. Hi Valentin. You can check for yourself how your SCHUFA score looks like. Here is more info. Anyone who willingly pays this now is a fool. If you already are paying you should stop and if you are thinking about starting to pay, don’t. The German TV license in its current form is not only a violation of German law but it is also a violation of Article 10 of the European Convention on Human Rights (look it up), which interestingly enough is only valid in its English and French translations. The issue with the German TV licence currently stands before the European Court of Justice (C-492/17) as well as the German Constitutional Court. This tax, which German courts have declared is not a tax but rather a fee, because it would be illegal if it were a tax, is bound to be smacked down by the the European Court of Justice, so anyone who is paying now is just wasting their money. Interesting. I still feel paranoid for not paying. I mean my boyfriend and I just registered in an apartment without TV or Radio and both received 17,50eur bill !! Both! Does that mean we both have to pay?! It’s so ridiculous. I wouldn’t mind if it was 1 or 2eur, but nearly 18eur a month for something you’re not watching or listening since years is a pure rip off. So Robert your comment is interesting, but how legit is it? Only one of you has to pay for the household. one household = one bill. First of all, thank you for this website. It has been amazing and helped me through a lot. I moved in last month in a WG with some other people, and yesterday I received a lettre to pay for the TV,radio,..
As you mentioned in your post, you can prove that someone is already paying it. Which is the case. How do I prove this? Just a lettre? Hi Siebe. Just send them the reference number of his/her contract to them.